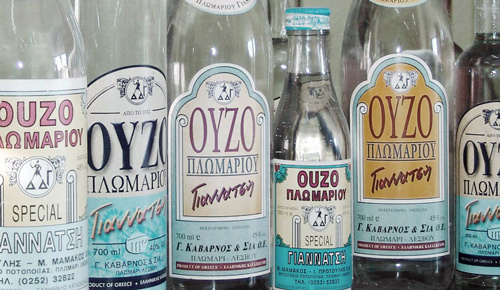 Small and large, over three hundred ouzo production companies exist in almost every corner of Greece. While each region is particularly proud of the quality of the ouzo they produce, only the island of Lesvos can say that it has the honour of being recognised nationwide as the home of "good" ouzo. This is definitely not a matter of luck. It is the result of many years of effort on behalf of our our people who have connected the "ouzo" product with their personal lives and their family names. The recognition of the distilleries of Lesvos originated, not only from the sharp increase in demand for the product over the years, but also from the 2004 Ministerial Decision that ouzo from Plomari and Mytilene should be recognized, as a «product of Protected Geographical Indication», which makes us unique in terms of the superior quality of our ouzo. The distinctive title, PGI, is awarded to products produced by traditional companies located in a single geographical area, which follow the same traditional production methods prescribed for the product (ouzo), using raw materials of local biodiversity (local water, local anise, local barley, fennel, mastic, etc.). These are the conditions that now determine the «Ouzo of Plomari» as a high quality product. The Giannatsis Distillery, fully accordant with these legal guidelines, uses modern technology, commitment to the knowledge of the art of distillation, and continues to use the same methods that it has practised for the last eighty years. It still produce high quality products that travel everywhere and represent Greece and Lesvos worldwide.